The Planning Center coordinated and supported the annexation of this property into the City of Tucson. This included assisting in a Pre-annexation Development Agreement with the City. At the same time a Planned Area Development (PAD) rezoning was processed for the property. 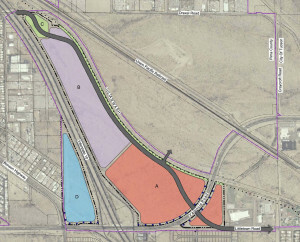 The property’s location at the intersection of Interstate 10 and Valencia Road positioned it for a mix of commercial, light industrial and high density residential uses. The PAD was written to exempt future large scale retail uses from the provisions of the City’s “Big Box Ordinance”. Approval of this rezoning also facilitated the completion of a critical section of the Loop Multi-purpose Trail system in this part of the community.